That’s how Fetty Wap’s love note begins in his song “Trap Queen,” but that is in no way the beginning of the song. An entire opera happens in the 14 seconds before Fetty introduces himself to his Trap Queen. If you’re confused right now, that’s OK. Let’s take one step backward. 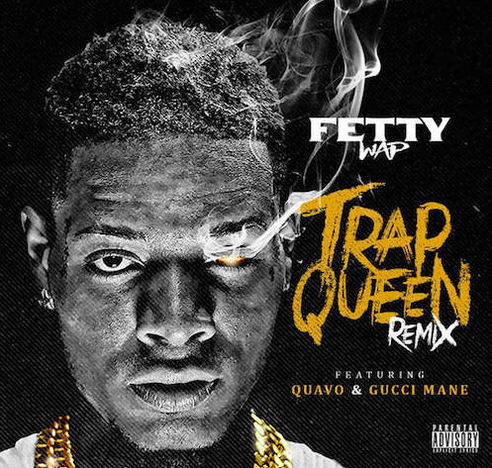 “Trap Queen” is a character, but “Trap Queen” is also the name of a song by an artist named Fetty Wap. That’s Fetty Wap at the top of the page. There’s lot to learn about Fetty Wap, with much to discover online, including Grantland contributor Corban Goble’s interview with the artist on Pitchfork. Some Cliffs Notes: his left eye (lost to glaucoma as a teenager), his rumored 14 kids (he has only two), his hometown (Paterson, New Jersey), his real name (Willie Maxwell). But we’re not here for facts today. We’re here to look at what is so resonant about his hit single “Trap Queen,” which has technically been out for more than a year. There’s a palpable confusion surrounding this song, largely based on the question “Why can I not stop listening?” I’ve been there, and chances are you’re there too. So let’s figure it out. In only three seconds, it’s highly likely that Fetty already has you hooked. There’s a real sense of urgency in that initial windup, as if he’s got something to say. Something important to say. If that rising action feels familiar, it’s probably because you listened to rap in 2008 — specifically, rap songs produced by Drumma Boy. The structure is familiar. On songs like T.I.’s “What Up, What’s Haapnin’” and Young Jeezy and Kanye West’s “Put On,” Mr. Boy instantly gets your attention by way of the sirenlike crescendo. The producer of “Trap Queen,” Tony Fadd of RGF Productions (as noted by the child’s voice in the beginning of the song), uses the same trick to get you excited and alert you that the song is building to something. And without fail, every single time you hear the song, you’re surprised and then immediately forced to ready yourself. And then Second 4 happens. And you’re at attention. The buildup was just preparing you for another buildup, staccato notes flying your way that create excitement, anxiety. You’re certain this second buildup is no fake-out. This is the real thing. It’s that moment when it’s clear you need to get in position for something. “Remy Boyyyzzzzzz, yaaaaaah” and “1738,” are uttered, which seems random and nonsensical, adding to the confusion, the anxiety, the excitement. But it’s also the first time we hear Fetty’s voice, which is some kind of croon or yodel. You were wrong. We’re not there yet. It’s still building. What surely felt like the final buildup was yet another buildup to Fetty’s verse — a Trap sonnet (13 lines) — to his Queen. The first line is instantly inviting. Salutational first lines are a great way to begin a song (see: Lil Wayne,”I’m Goin’ In“: “Hello, mothafucka, hey hi, how ya durrn’’?”), not to mention a career. If you’re in a crowd, you’ll want to look right at someone and rap it to them. This person will mostly likely be rapping it right back at you — a trend that can continue for the rest of the verse. Whoever you rap this verse at is your Trap Queen. And if someone raps this verse at you, you become their Trap Queen. It could be your lover, your friend, your dog, or your steering wheel — all are eligible receptors of this romantic tale of teamwork, and all qualify as Trap Queens. Like something is more beautiful than that? But don’t forget — this is still the buildup. And the buildup consumes you, because you know at some point it bubbles over. On “go,” we finally get there. Fetty keeps your attention in a variety of ways for 54 seconds, and then there’s the release. “Trap Queen” is structured like an EDM song, with the first line of the hook, “And I get high with my baby” serving as the moment when Calvin Harris would hit the button that release the confetti. Fetty and his queen at the mall are romance personified. It’s a great hook, but it leads to one glaring flaw. After the hook, Fetty goes against everything he’s built in the initial 1:20 and decides to rap. Fetty Wap’s strength is not rapping. To say he can’t rap is a little strong, but it’s certainly the low point. So even while he’s singing the hook — and you’re enjoying the hook — you have to prepare yourself for his coming barked rap verse. This is next-level self-awareness from Fetty. The remix, released Monday evening, is exactly what it’s supposed to be: Fetty for the first three Fetty buildups, right into verses by two rappers, Gucci Mane and Quavo (one-third of Migos), and zero Fetty raps. Gucci’s verse sounds like honey being poured on a Popeyes biscuit, and Quavo’s performance is reminiscent of every other Quavo verse: inspirational. Neither of these verses are new. Quavo recorded a “Trap Queen” verse in January. Gucci’s verse is a word-for-word replica of one from “At Da Jugg House” on his 2014 mixtape with Young Dolph and Peewee Longway, Felix Brothers. So, yes, the “Official” remix is a cut-and-paste job, which ruins the illusion that remixes are a collaborative effort that take place in the studio. If that doesn’t sit well with you, just listen to it. Once you do, you’ll realize it doesn’t matter because the jump in quality from “Trap Queen” to “Trap Queen (Remix)” is like going from San Francisco to New York City. You thought your life was fun, but then you realized you didn’t even know what fun was, because you had lived in San Francisco. There’s a good chance Fetty will make it through the summer. In addition to the original song (currently at no. 3 on the Billboard Hot 100), this remix, and a U.K. remix featuring Azealia Banks, there’s the definitive modern-day career extender: an Aubrey Drake Graham remix. A version of Fetty Wap’s song “My Way” was played at a club Monday night, and it featured a Drake verse. The version isn’t high quality, but what matters for Fetty is that it’s happening. May 5, 2015, is a landmark day for Fetty Wap. Two remixes in one day. And he’s not done. To top it off, he’s performing on The Tonight Show Starring Jimmy Fallon, tonight.